This is the poignant story of a son's suicide and what you do to get on with your own life afterwards. Singer/songwriter Judy Collins' only child Clark killed himself, leaving behind a daughter and a broken-hearted mother, not to mention other family members and friends. What drove this man to take his own life? One never really knows why but Ms. Collins paints a picture of her son's life, and her own, that reflects a beautiful and talented person. At a young age he battled drugs and alcoholism. His maternal grandfather drank heavily, as did his mother. She reflects on what she could have done to prevent her son taking his own life (there isn't anything any one person can do - it's entirely up to that individual, and once they decide to end it all, there's very little anyone can do to stop them - reviewer's opinion) and the guilt she lived with and how she managed to get on with her life. She talks about what she did to cope and continue living a full life. Be it depression, alcoholism, a chemical imbalance, fear, anger, or whatever it is that is driving you towards taking your own life, there is help, and suicide is never the answer. There is also a list of books Ms. Collins suggests as good reading material. 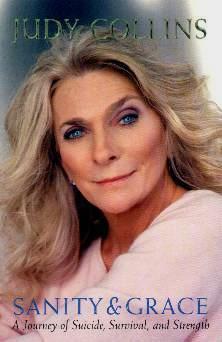 Visit Judy Collins at her website at www.judycollins.com. Conclusion - Moving and insightful.